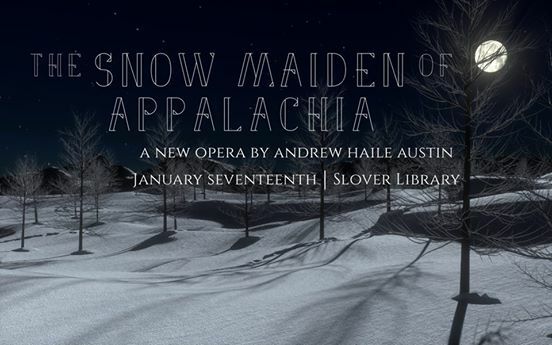 Come see the first performance of The Snow Maiden of Appalachia! January 17, 2016 at the Slover Library in downtown Norfolk, VA.
flute, piano, violin, and cello. the opera takes place in Western Virginia in 1927.
who comes to life and fulfills their wish for a daughter. reuniting with the woman he deserted, falls in love with the Snow Maiden on first sight. ​in the moment, before she disappears?